Schools receiving Healthy Farms & Healthy Schools grants are invited to take advantage of the opportunity to include KJ and her music in their educational programming. 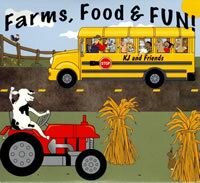 KJ?s participation in Healthy Farms & Healthy Schools events is being provided at no cost to grant recipients. Please contact KJ to schedule a live performance. Whether you are a child...or an adult who never wants to grow up... these fun songs and active lesson plans will keep you and "no age barrier" audiences humming, dancing and giggling! What a sensational way to be reminded that smart eating and physical activity, key topics in today's education, can be taught in non-conventional ways! School standards and wacky songwriting are truly mixed here in finding a balanced way of life in learning through healthy farms and healthy schools. Go ahead...Make a positive difference in your day! Dance and sing along to these songs you can't begin to forget! I remember growing up outside of the city, thinking that chocolate milk came from a brown cow! I don't think I was the only one, either! Visiting my cousins' farm for the first time was a real eye opener! Each day, I continue to learn so much about agriculture and how it affects each one of us. No matter whether you're from the city, the country or somewhere in between, you and your younger learners will get a positive boost from these songs...and will learn while listening AND participating! Let's celebrate Agriculture!